Home » Resources » What is Infrared? Infrared heats people, floors, walls, and other surfaces directly without heating the air first. The result is an instant warming effect, similar to the effect felt when the sun emerges from the clouds on a chilly day. When infrared heating is used in an enclosed building, objects in the space absorb the emitted infrared energy. Once absorbed, the energy is converted into heat which in turn warms the surrounding air. 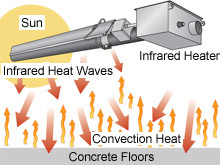 With convection space heating, the air must first be heated and then circulated in order to warm objects and people in the space.Through various methods of heat transfer (radiation, re-radiation, conduction and convection) the air is heated secondarily as it passes over the warm concrete. Therefore, the heaters can be controlled by air temperature sensing thermostats. Infrared heating is a system or appliance that provides heat by thermal radiation. A gas fired infrared heating system emulates the efficiency of the sun by generating radiant energy that is converted into heat when absorbed by objects in its path. Once the infrared energy is absorbed by the floors, machinery, stock and people, it is then re-radiated to warm the surrounding air.